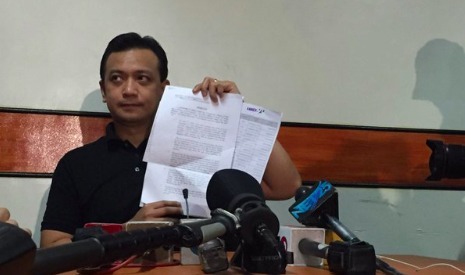 MANILA, Philippines- Vice presidential aspirant Senator Antonio Trillanes IV has executed an affidavit indicating where he got the information from Davao City Mayor Rodrigo Duterte’s bank accounts in Bank of the Philippines Islands (BPI) Julia Vargas branch on Monday, May 2. 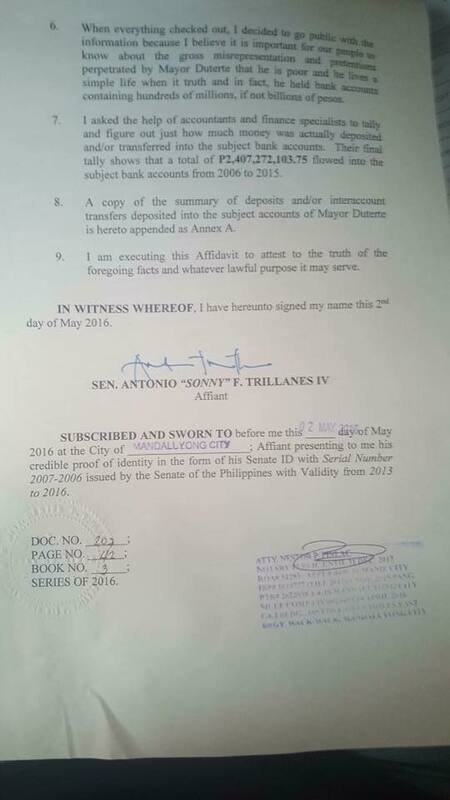 Trillanes presented the affidavit in exchange for a bank secrecy waiver from the PDP-Laban standard bearer. However, in his interview with Balitanghali, Trillanes revealed that Duterte’s legal counsel Atty. Salvador Panelo, requested a copy of the account balances of the tough talking mayor’s bank accounts from BPI instead of providing a waiver. Panelo was authorized by Duterte to open the presidential aspirant’s bank account and provide a bank certification debunking the P211 million hidden wealth allegation against him. "I went to the bank and I had them receive the special power of attorney of Mayor Duterte authorizing me to look into the records of his bank account and to ask the bank for a certification that at no time since the opening of the account has there been P211 million whether singly, collectively, or cumulatively deposited to his name. 'Yun ang hiningi ko sa bangko,” Panelo told GMA News. However, Panelo revealed that BPI asked for 7 days in order to look into their request due to legal issues. This means that the bank account details will be disclosed on May 11, two days after election day if the 7-day period would only include banking days. Panelo added that they did not ask for a transaction history since the issue is the P211 million deposit in Duterte’s bank account. According to him, Duterte’s current balance in the said account is P17,660. 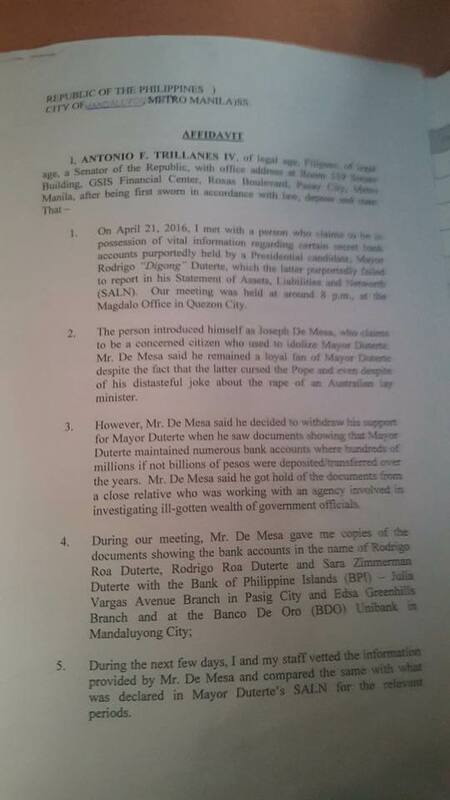 In Trillanes’ affidavit, the lawmaker tagged a certain Joseph De Mesa as his source of information on Duterte’s alleged hidden millions. De Mesa, a former Duterte supporter, apparently has contacts in an agency that investigates ill-gotten wealth of government officials.